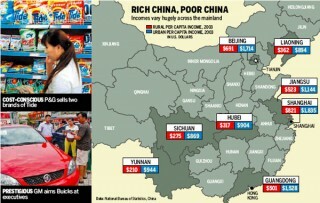 Chinas wages increase and lead to a deep gap between rich-poor. The China labour bulletin shows that wages increase very much over the past two decades. This leads to a very big gap between rich and poor people. Of course the highest minimum wage is to be found at the coastal area just like Shenzen, Shanghai, Shangdon and so on. Compared to other countries in Asia …………..the monthly minimum wage is very low and can be compared to the minimum wage in the Philippines, Indonesia,Thailand and Vietnam. The other south-east countries in Asia, just like Taiwan, South-Corea and Japan give very much to the level of minimum wage in China (China about 300 USD per month, Japan about 1600 USD per month). The difference between migrant workers average monthly wages to the national average wages is about 2200 Y vs. 4000 Y per month. This big gap between rich and poor is one of the top-priorities of the new leadership in Beijing. One big unresolved problem is the leck of an effective social- and medical welfare-safety net. Of course it’s also important to find a good system for reasonable pay and conditions for workers so that the local cost of living is not a problem. This big gap will lead of course, as it can be seenin western countries, to big problems. The social Problems is the one side which will be answered by the government. But there are also the psychological and psych-cultural problems which cannot be administratively solved. Insofar this big gap also produces a big cultural challenge and Impact.